Team Suzuki Press Office – November 13. Team SUZUKI ECSTAR’s Maverick Viñales and Aleix Espargaró raced to fifth and eighth positions in the final round of MotoGP™ 2016, the Gran Prix de la Comunitat Valenciana in Spain this afternoon. The last Grand Prix of the season ended consistently with both riders capable of fighting in the top positions, especially Viñales well into podium positions for several laps. Fourth place on the grid and one of the best starts of the season saw Viñales recover positions and turn in third at the first corner and the positive set-up finalised during the weekend allowed him to hold third place for many laps. With the tyre drop, however, he had to give-up two positions and from then on wasn’t able to fight again to recover, although he held onto fifth place until the end. Espargaró had a consistent race, from ninth place, although he had to give up a couple of positions at the beginning, but kept in touch with competitors to recover to ninth in a few laps, engaging a fierce battle for eighth and then chase seventh. His strategy to preserve the tyres for the last part of the race allowed him to keep his pace and close the race in eighth. 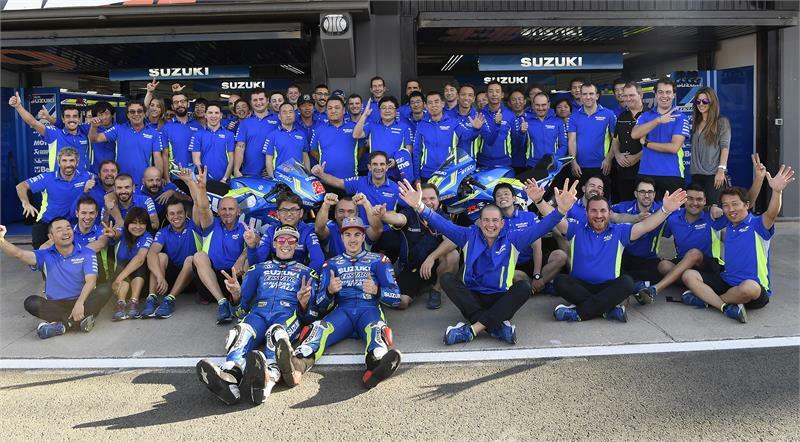 This was the last race in Suzuki colours for Espargaró and Viñales, who have been the protagonists of Suzuki’s comeback to MotoGP™. These two years have seen the machines, the riders and the crews grow very fast, catching-up the competitors in such a short time and now being able to fight with the best manufacturers. All the people in the Team at the circuit, as well as the engineers and management in Hamamatsu, Japan want to say a big thank you to both for these two years together.